I’m hoping Nate doesn’t read this before he leaves work so that he can live in the ignorant bliss that he’ll have a good dinner tonight. Today’s kitchen tip: pay attention to what you’re doing while you cook. I know, this is a difficult concept to try to get your brain around, very abstract, very rocket science. Paying attention means that you’ll end up with delicious, fluffy, yummy mashed potatoes. NOT following this simple advice means you end up with what can be best described as mushed potatoes. It is NOT a good idea to dump a bunch of milk willy-nilly into your pot of potatoes. I’m quite sure my mind was elsewhere…maybe on my to-do list, maybe on chocolate covered pretzels? Certainly not on mashed potatoes, hence the mush. Ironically, Cate liked these WEIRD-O potatoes (the picture is not getting across the STRANGE texture and appearance) better than any others I’ve ever made. Who can account for a toddler’s taste? Making pancakes is a lot more fun nowadays with little Cate to help out. This weekend we made them TWICE. Cate loves pancake mornings – baking AND eating. Saturday she ate FIVE…I didn’t know 2-year-old stomachs could hold so much food. By the way, that was more pancakes than I ate – honest! Seriously, though, watching Cate stir the batter did my heart good. My little sidekick just brings me so much joy. I’ve recently come to the realization that I’m not the stay-at-home mom I thought I was…yes I stay home, but I am a working mom. It’s a strange transition for my psyche to make. Work has gotten kind of busy lately – I’m grateful for it, but I do need to make sure I don’t ignore my buddies (i.e. Cate & Nate). This is something that’s been on my mind a LOT lately. Now that my heart has realized that I’m a “working mom,” my brain knows I really need to consciously prioritize the people and things that matter. I think I do a good job, but always need to keep this top of mind. If that means making more pancakes, so be it. Bring on the blood sugar spike. This week is gonna be CRAZY. Cate and I are driving 751.04 miles alone together. (See title of post.) As luck would have it, both sets of our East Coast parents will be in Utah visiting the same week, and my brother is supposedly graduating from college, so time to hit the road! Thankfully my dad will be with us on the drive back, so only 1-way of total, absolute, sheer craziness. Anyway, between work, packing, exercise, drinking my daily amount of water, trying to be a good mom and volunteering from 5-10pm the day before I leave…I’m going for EASY meals this week (enter Trader Joe’s…so sorry to the TJ-less people out there!). No meals at the end of the week since Cate and I will be movin’ on down, movin’ on down the road. And no worries – I’ll still be posting on the trip! Here are our empty road trip goodie bags…what yummy things will find their way inside by Friday? 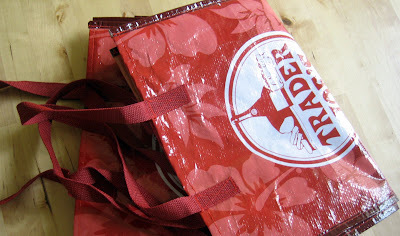 And when is Trader Joe’s going to start paying me? This week’s Song of the Week may cause me to lose some credibility, at least with staunch Republicans and country music haters. Oh well – I gotta be honest about what I’m listening to while I cook! Drumroll…“Silent House” by the Dixie Chicks. I’m not a huge country person, but I have always liked the Chicks…and I bought this BEFORE they won all those Grammys (that may have been a little overboard)…despite all that, I really do like this album – there are some good songs on here. The harmonies on this song are very pretty. POST YOUR MENUS! Post anoymously if for some reason you don’t think it’s good enough (which is silly). We all want to know what you’re eating! 🙂 Also, since I’m not full of real menu ideas the next two weeks, peruse past weeks’ menus for inspiration! – Which lucky family member is making me dinner this night? It’s Saturday. Phew. I had today’s post all planned in my head, but I just don’t have time to do it justice this morning. And since you’re all busy doing fun Saturday things anyway, today is a quick post – no pictures or nothin’! Check out this cool food blog, Kokblog. It’s a cooking blog by a woman named Johanna Kindvall. She grew up in Sweden and is an architect, artist and former social worker who used cooking to work with drug addicts and mentally ill patients. So cool. She illustrates everything on her site – a very creative and unique touch. I haven’t tried any recipes yet, but it is just such a cool site. Enjoy! 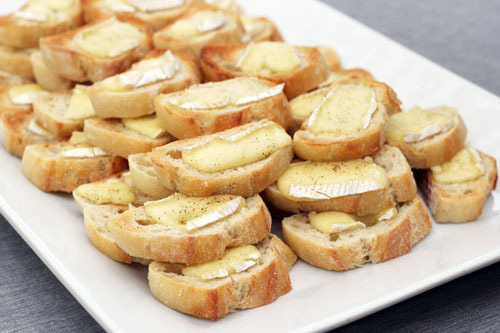 Place sliced brie on bread pieces. Sprinkle with garlic salt and pepper. Broil on baking sheet until cheese just bubbles and things start browning (don't cook too long or brie will be unrecognizable). 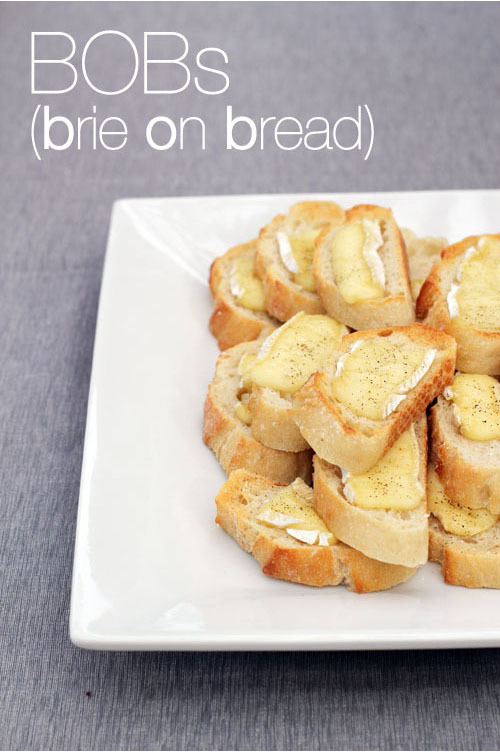 Jane's gourmet twist (if you want to make things harder on yourself): Brush baguette slices with a bit of fresh garlic-infused olive oil instead of using garlic salt. Then sprinkle with pepper AND regular salt. Today Lindsey Johnson is our guest blogger! Lindsey has two great blogs I love to visit: Cafe Johnsonia & Just Recipes (Lindsey is the source of those delicious Brownie Cookies I wrote about). Lindsey was recently a week-long guest blogger for the fabulous Design Mom as well. I’m so happy we get to have her here – thank you, Lindsey! Can I start by saying what an honor it is to be a Guest Blogger on the great TWFD blog? Jane is such a gracious host. Don’t you just love her blog? I’m sure you are like me and have your favorite recipes that are your “go-to” recipes. They are familiar and comfortable and hard to mess up. I love those kinds of recipes. I’ve assembled my list of recipes that I “go-to” on a regular basis. I hope you will post your own “go-to” ideas and recipes in the comment section so we can all get some new ideas and maybe even find a few new favorites. When I’m taking dinner to a friend that has just had a baby or when I haven’t shopped, or when I just want to eat some good, old comfort food, I turn to Chicken Pot Pie with Biscuit Topping. I always have the ingredients on hand and I know that it will last a few days for leftovers. And it’s really, really good. The recipe was originally a Cooks’ Illustrated recipe that I’ve kind of made into my own. I’m a huge fan of simple meals. I like the occasional casserole (like the pot pie), but usually I am doing some kind of chicken, beef, or pork with two sides. The easiest sides, for me, are those that can be done quickly and cook while the main dish is being prepared. Enter Roasted Veggies & Potatoes. Follow the recipe here and you will be eating your veggies like candy. I adore green salads. (And most other salads, too, really.) Growing up, salad was that iceberg lettuce mix with shredded carrots and ranch. Hmm. Pretty boring. No wonder I didn’t like salad much as a kid. I love that you can find gourmet greens in most supermarkets now. And there are myriad ways to dress up those greens. You can add pretty much anything you want and have a great salad. I also have two favorite vinaigrettes/dressings, Raspberry Vinaigrette and Creamy Apple Poppy Seed Dressing. Moving on to dessert”¦my favorite. I try to only make dessert on Sunday night, but by Wednesday I find I gotta get me some chocolate. Two of my all-time favorite recipes have come from Martha Stewart. It has taken about 26 years to really love chocolate. (I shouldn’t tell you that because I don’t want to lose my credibility.) 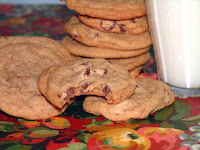 There isn’t a day that goes by that I don’t have a handful of chocolate chips, or something chocolaty. But when I get really serious about my need/want for chocolate, I go straight for brownies. I found this recipe for Brownie Cupcakes when I was searching for something else and there was no looking back. They are easy. It only requires one bag of semi-sweet chips””I always seem to have those on hand. And again, no mixer required. They are good with or without the chocolate frosting. But make sure you have a big glass of milk nearby. They are so rich and fudgy. Now that I’ve shared my “go-to” recipes, I want to hear what your “go-to” favorites are! Okay, today’s post doesn’t have to do with food or dinner, but it does apply to the kitchen, so I think it counts! Allow me to introduce you to the power couple of the cleaning world – Vinegar & Baking Soda. If you have a stainless steel sink, these two ingredients are the perfect, non-toxic way to clean and disinfect. I just sprinkle baking soda all over the sink, pour some vinegar over that, let it sizzle, then scrub away! Another of my favorite uses for this dynamic duo is pouring 1/2 cup of each down the drain and letting it sit for a bit. A great way to clean your drains. While vinegar and baking soda make a great pair, vinegar is pretty stinkin’ awesome on its own. Check out this great info from the Queen of Clean on the DIY network. This is the only episode I ever saw of “Talking Dirty with the Clean of Queen” (gotta love it) and I am so glad I did. I’ve incorporated vinegar into my cleaning ever since. Happy disinfecting! I already knew I was dehydrated, but apparently an IV is in order. My friend Karen (who’s awesome fitness blog will be launching soon!) introduced me to a calculator on fitsugar.com. You can put in your stats and find out how much water and food you need daily based on your activity level. I don’t need 8 glasses a day…I need ELEVEN! What the?!?! I don’t even have 11 of the same glass for this picture! New mantra: drink more water. With new mantra in place, any tips for getting ALL THAT WATER down every day? One of my favorite fellow bloggers has just launched her website and I’m so excited to let you all know about it! Hostess with the Mostess is a marvelous place to go for entertaining ideas and more! The site has cool, fun, unique, hip, cute (I could go on but I’ll stop) ideas for entertaining. Her blog will also continue to be amazing at http://hostessblog.com. And keep an eye out…I will be making appearances here and there on the site and the blog!